Leighton Moss To intervene or not to intervene – that is the question? To intervene or not to intervene – that is the question? I did not think much about intervening in anything when I was a boy of 8 yrs old. I was just a bit obsessed by all things birds. I remember the little reception hut (like a garden shed) that was located near the start of the path that now runs to our new boardwalk. There was a charismatic chap there with a flash of blonde hair and an energetic personality (which I realised later was John Wilson, the Senior Warden). He handed us our permits and we wandered along the narrow path, completely enclosed by reeds, to the Y.O.C hide (now Lilian's hide). This was not simply a journey through reeds to a hide overlooking water and hopefully lots of birds though, it was full of anticipation, full of mystery..the obsession...the bird of the bog...the elusive, the secretive, the mythical...THE BITTERN! I spent two hours in that hide with my gran, watching every reed to see if it would move. Despite seeing bitterns in bird books I couldn’t imagine how one would look for real. Then someone pointed one out...oh my goodness – where is it? I still couldn’t see it. I kept looking and looking but only had binoculars, and then a sympathetic ‘expert’ let me peer through his telescope. I couldn’t believe it – it was ‘star-pointing’ - stood with its bill straight up in the air, perfectly camouflaged, just in the reeds not far from the edge of the water – and it didn’t move an inch as I watched. I was so excited and have never forgotten this experience. Ever since then, I have had a connection with Leighton Moss and bitterns – and the place and bird have had a well-known association for many years. It was the place to see bitterns in northern England and for a period, one of the best places in the country to spot them. And so it was, with the loss of the reedbeds on which they depend, bitterns sadly declined nationally (at their lowest ebb in the 1990s when the population dropped to 11 males), Leighton remained a stronghold. It continued to be a stronghold through all the years that I made return visits to Leighton Moss after my first bittern initiation. Then in 1990 I came to live on site for 12 months as a residential volunteer. It was still the place to be for bitterns and I remember doing a bittern boom count in the early hours of the day. My shift was one of many, meaning that as a team we counted the ‘boom sequences’ over a full 24 hour period (when a bittern booms, it does several in one go and that set up of booms is called a 'boom sequence'). Below is an example of a bittern boom count. The peak booming is just before it comes light and when I did the count it was similar to this one. Imagine that at 4.30am on a May morning - the place was alive with the sound of bitterns booming, so much so that it would be almost impossible to have time to write down the boom sequences. 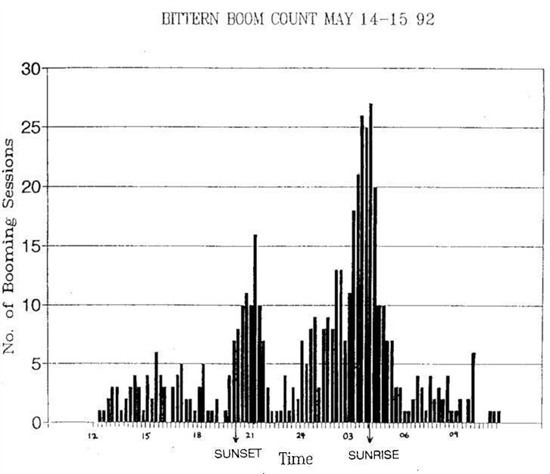 In this case there were 27 booms in a 15 minute period – that’s a bird booming every 30 seconds! 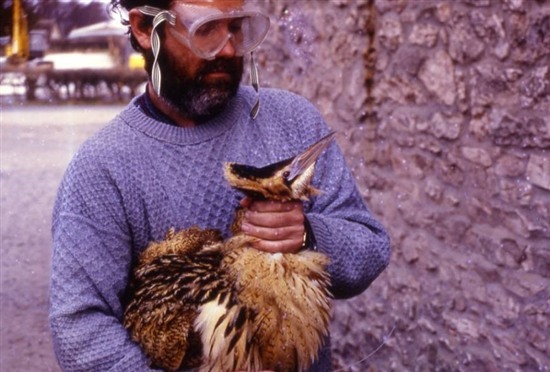 It was in 1990 that we also caught 'Phil the bittern'. Glen Tyler, researcher extraordinare (in the image below), banged on the door of the volunteers accommodation one day. He had spent many months figuring out how to catch a bittern and finally, there he was, with a bittern! He needed help to weigh, ring and radio-tag the bird, so in a panic I rushed out to help. The radio-tag meant we could follow it around (we did for many months), working out its favourite places. My relationship with bitterns became even more intimate! After that year, as I headed off on my career in conservation (Symonds Yat, Highnam Woods, the Farne Islands…) I didn't imagine that I too would become a bittern researcher. Then in 1997 I came back to Leighton Moss to do just that.I located bittern territories and found a nest. 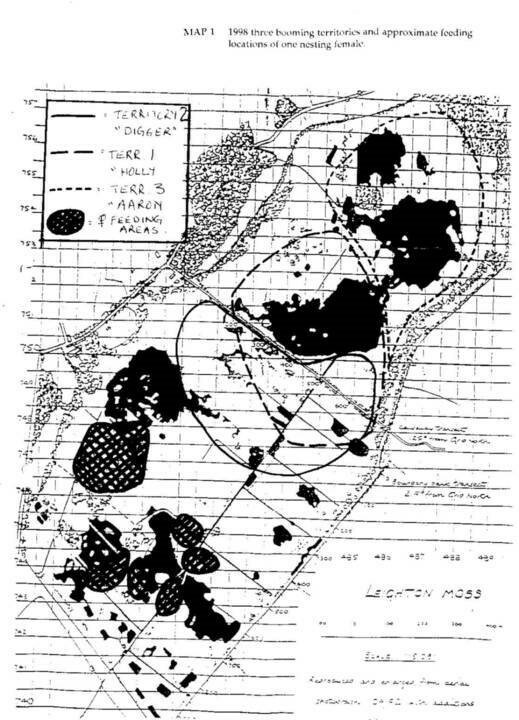 Below is one of the less than technical maps I produced, showing that even then there were three booming bitterns at Leighton Moss and it remained a stronghold, with only 11 left in the country. I became so obsessed that I stayed put for another seven years. I transitioned into the role of Assistant Warden and my personal journey with Leighton and bitterns was almost complete. And so, back to the question, to intervene or not intervene? Well, after being a stronghold for so long, bitterns sadly declined at Leighton Moss, to the point that from 2003 onwards, there was just a single bird booming and even then, for many years, it just did a half-hearted boom at the beginning of the season and then just gave up. But thanks to conservation efforts, bitterns were actually starting to do well nationally (166 boomers last year), so what was the problem at Leighton? The reedbed was getting old and drier with the year on year build-up of reed litter. The water bodies were becoming shallower with a build-up of silt and there were issues around water quality. So, why decide to make some big interventions? Why for just one booming bird? That one bird is the reason that Leighton Moss is a European Designated Special Protection Area ,so we have an obligation to make sure it is in good condition for bitterns and to hopefully keep them breeding. Reedbed is also an extremely scarce habitat in north west England (and indeed throughout the UK). Having bitterns is a great indication that you’ve got a good, healthy reedbed, that’s also home to many other reedbed specialists and a variety of more generalist wildlife too. Some might have argued to just let Leighton do its own thing, let nature take its course. It would have become drier and scrubbed over, becoming wet woodland. In a natural landscape without sea walls, embanked rivers and lots of artificial drainage, reedbeds would come and go – aging here, appearing there. But we live in man-made landscapes, reedbeds can’t come and go, so we need to cherish the jewels that remain! 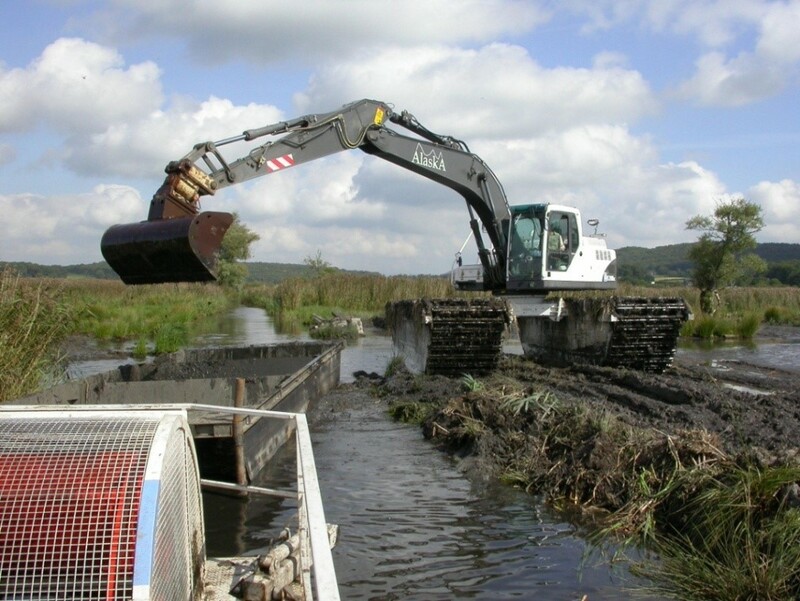 Maintaining Leighton Moss as a high quality reedbed for bitterns called for radical action! We decided to go on a journey of removing silt from the pools and ditches to take the reedbed back in time. It was getting old and as bitterns like young reedbed, in the earlier stages of development, we needed to dig it out in places. This technique had worked well at Minsmere in Suffolk and had transformed an ailing bittern population (down to just one booming male) to around 10 males there. Unfortunately, Leighton was an altogether different ball game! Different ground conditions, different reed condition. Though the silt removal from the pools worked well to improve the water quality and restore fish populations, the areas we excavated to revitalise the reedbed just ended up as gloopy mud. Also, though there were some small signs of reedbed spread, it was also clear that a growing red deer population was impacting on any potential recovery as they were also causing considerable damage elsewhere in the reedbed. 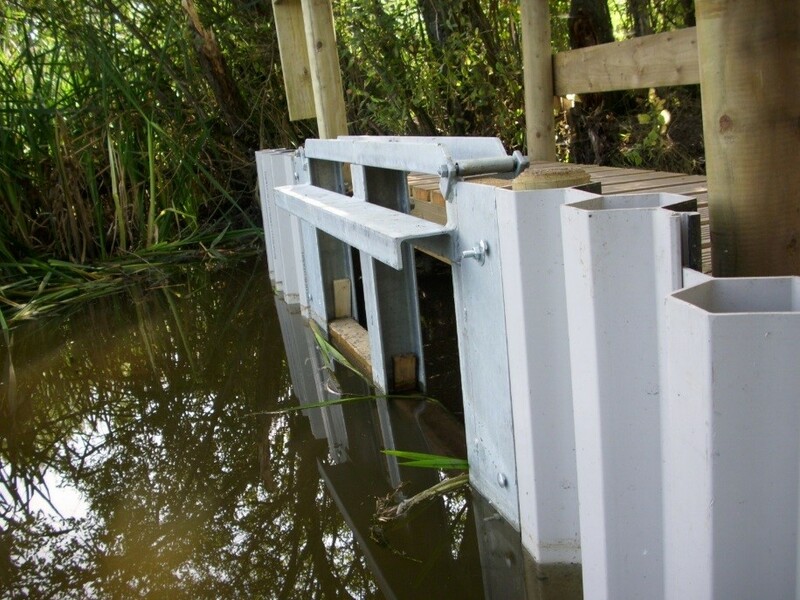 And so, we put in an additional water control structure at Leighton Moss so that we could drain down half the reedbed, the idea being that the muddy, gloopy areas would dry out, the surface of the reedbed would be aerated and stabilise, and suitable conditions for plant colonisation would be created in the excavated areas. We also started to manage deer. Leighton Moss being the only place in the Arnside and Silverdale AONB where there was no form of deer management meant it had become a focal point for the red deer of the area, disproportionately increasing the impact of their damage to the reedbed. As a little boy of 8, marveling at this mythical bird, I was able to see one on my first visit. That’s not been the case as I hit my 40s – whilst we have alwas had regu;ar bitterns through the winter, sightings in recent summer months have been few and far between. This summer, there have been many sightings from the Causeway hide as the female flies backwards and forwards on feeding flights – taking food to her chicks. It has been a long road to recovery, but we are making the first steps. 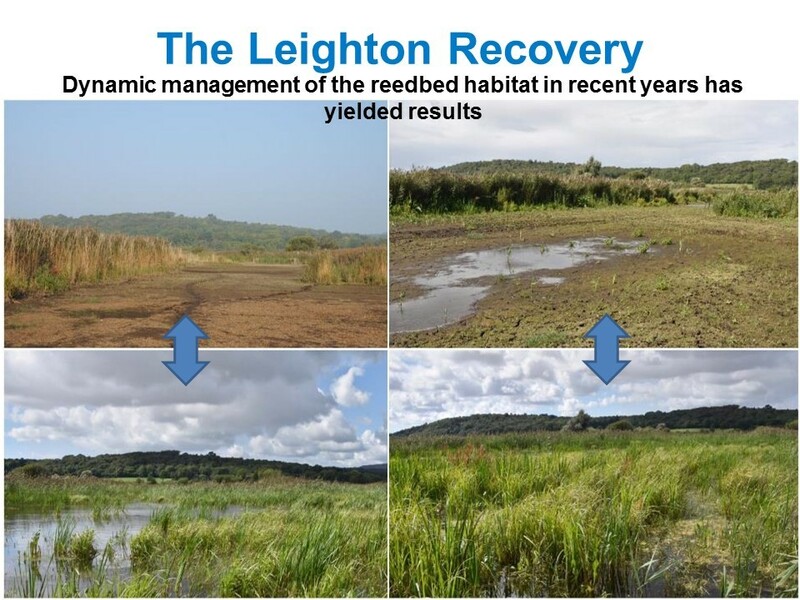 We need to keep intervening, we need to keep Leighton Moss dynamic. It wouldn’t be the special place it is without doing it, for bitterns and for all wildlife here. For me the answer to the original question, is without doubt, ‘To intervene’.